Old technology and lack of maintenance characterize many district heating networks in Ukraine – some over 60 years old. 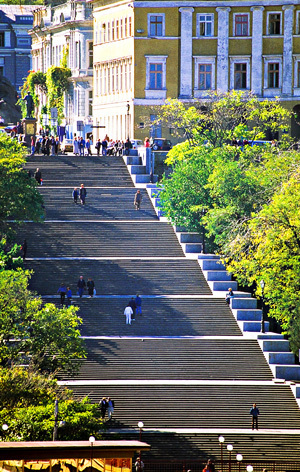 In the city of Odessa, the authories have launched an ambitious renovation project, starting in the Yuzhnyy district. The makeover included new boilers, pipes, heat exchangers and substations. The result: total energy savings of up to 50%. The new system replaced a traditional, dual-circuit network design characterized by high water flows, inflexible heat supply and excessive hot water tapping. Instead, a modern 3-circuit solution was introduced, with circuits for production, distribution and household consumption. The circuits are separated by plate heat exchangers and substations from Alfa Laval. Previously, consumption was controlled by only three large substations. These were now replaced by 40 small and efficient substations from Alfa Laval – one per building served. Several large Alfa Laval plate heat exchangers separate the production and distribution loops of the network, while transfering the heat. Thanks to the high thermal efficiency of these heat exchangers, temperature and pressure levels, as well as the water flows, can be kept relatively low. This means less water needs to be produced by the boilers. It also allows for smaller piping dimensions and pumps throughout the system. The individual substation in each building captures exactly the heat needed for space heating and produces the hot tap water locally. The district heating renovation project in Odessa has become a model for other Ukrainian cities. And the results are impressive: total energy consumption has dropped by 50% (enough to heat 800 single homes in Sweden), direct system costs are down by 30%, electricity costs by 40% and water consumption by a stunning 95%. In addition, CO2 emissions are reduced by 3,800 tonnes per year. Plate heat exchangers T5M, M6-FG, M10-BFG and MX25-BFG controlling the heat production and distribution loops. 40 complete Maxi district heating substations controlling heat consumption. They have built-in plate heat exchangers and range from 260 to 2700 kW in capacity.